La Mesa Healthcare Center is committed to creating a diverse environment and is proud to be an equal opportunity employer. All qualified applicants will receive consideration for employment without regard to race, color, religion, gender, gender identity or expression, sexual orientation, national origin, genetics, disability, age or veteran status. 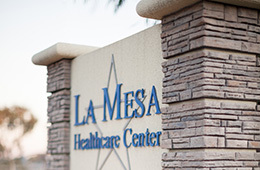 La Mesa Healthcare Center, a 5 star skilled nursing facility, is looking for Licensed Nurses (RN and LVN) to join our dynamic and energetic team. We have opportunities available for all shifts for interested candidates looking for full or part-time/per diem or on-call work. Our facility is conveniently located near the 94 freeway with accessibility to the 8 and 805 freeways. If you possess a positive and caring attitude, please stop by and complete an application. La Mesa Healthcare Center, 3780 Massachusetts Avenue, La Mesa, CA 91941. Monday through Friday 8:00 a.m. to 5:00 p.m.